Beautiful skin starts with the right treatment. The Australian designed and built ASAP Microplus+™ machine has featured in Bazaar, Cosmo and Vogue, and offers instant improvements to patients’ tone and texture. 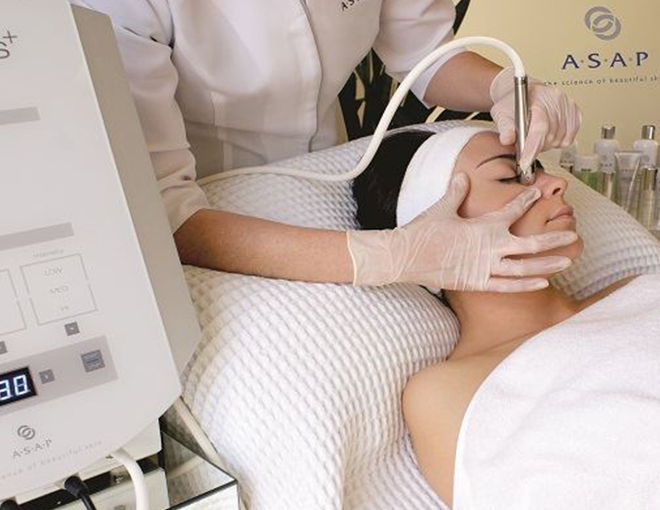 The device combines Microdermabrasion- a smoothing exfoliation with the addition of gentle suction to deep clean and prepare the skin’s surface, and Sonophoresis- therapeutic ultrasound that allows us to deliver potent active ingredients deep down into the skin. Together, they are an effective way to manage everything from fine lines, wrinkles, dull tired skin, superficial pigmentation, acne scars and acne blemishes. Microdermabrasion is a safe and gentle procedure that exfoliates the skin to stimulate new cell growth and the renewal of collagen. Using a gentle vacuum system your circulation is improved, delivering oxygen and nutrients to your skin cells to revitalize them. At the same time an abrasive diamond tip removes dull, dead skin cells and unclogs pores to give the surface of the skin instant polishing. Am I a suitable candidate for microdermabrasion? Nearly anyone can have microdermabrasion as the level of exfoliation can be modified to match the skin type, and it is useful in treating a variety of skin concerns. It is fantastic for men, and can be performed as a stand-alone service or as a course. It is also an excellent maintenance treatment, supporting other services like laser and injectables. We do not recommend microdermabrasion for active rosacea skins, or overly delicate, fine skins. Sonophoresis is a non-invasive adjunct skin treatment. It utilises low frequency sound wave technology to deliver active ingredients trans-dermally into the skin. This warm, massage-like treatment increases circulation - conditioning and toning the skin, while deeply infusing treatment products up to 800 times deeper into the skin. An immediate result is achieved with increased smoothness, firmness and hydration. Excellent as a course, especially when combined with exfoliating treatments. It is suitable for all skin types and delivers excellent results. Since any ingredient can be trans-dermally delivered with this method, we simply choose the right products for your skin on the day. Microdermabrasion and sonophoresis are both very comfortable treatments with no downtime. In some cases there can be mild pinkness in the skin following treatment that fades over the day, or can be covered with mineral makeup. This combined treatment offers instant results after just one treatment. To gain maximum benefits, a course of six treatments at two weekly intervals may be recommended. Your skin care professional will discuss with you the most suitable treatment program for your skin.